Long before Benny Goodman was credited with kicking off "The Swing Era" at the Palomar Ballroom in 1935, jazz music was bubbling up from early 1900's black communities in the American South and planting new roots in Harlem during the Great Migration of the 20's. Their revolutionary rhythms, swooping and syncopating into "swing" songs, inspired the Lindy Hop: a unique creation of the African-American diaspora in Harlem dance halls that went on to ignite a worldwide dance craze. Swing music became the driving soundtrack to economic crises, world wars, shifting gender roles, and human migrations, all on newfangled radio waves and the welcome distraction of motion pictures. Swing dancers strive to pay homage to the dance's origins while continuing to inspire the curiosity and creativity of a whole new generation of dancers. The most common apocrypha is that a reporter asked George "Shorty" Snowden what he was doing with his feet and he replied with "The Lindy" after the famous Lindbergh flight "hopping" the Atlantic in 1927. Details may differ, but nevertheless the dance gained reknown for its athletic stance, improvisational freedom, and characteristic "stretch" between partners that propelled and torqued each other across the floor. The Jazz Age of the 1920's saw "flapper" girls kicking their newly uncovered legs to the rhythm of ragtime in a dance called The Charleston. When the peppy, upright songs of the 20's began elongating into the swing rhythms of the 30's, the Charleston took on a crouched stance and horizontal kicks that pumped partnered dances full of energy. 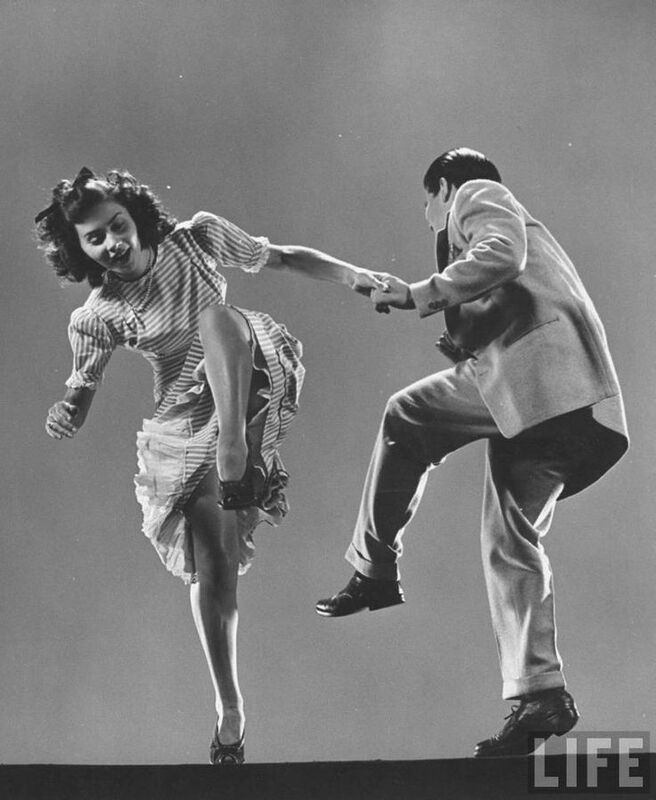 Charleston and Lindy Hop moves are often danced interchangeably on the social dance floor. What we call "Pure Balboa" originated in Southern California as a chest-to-chest dance characterized by its subtle, intimate connection, and intricate footwork. What we call "Bal-Swing" still carries the hallmarks of Balboa's upright connection, but allows partners to drift apart in what teenagers from that area called "swing". We frequently lump the two together under the heading "Balboa" and use the styles interchangeably as we dance. Jazz was a revolutionary music for a revolutionary time. New dances and steps were invented all the time, popularized, and then imitated by dancers charmed by the improvisational nature of the music. Many of these dances or moves were performed solo, as we still perform them today. Lindy Hop is known as the "grandfather of all swing dances" because its widespread popularity set the groundwork for an array of social dances developed in the modern (post-1950's) era. These include West Coast Swing, Bop, Jive, Boogie-Woogie, East Coast Swing, and others. While still considered "swing" dances, they are usually danced to modern tunes with more or less syncopated rhythms and not vintage swing-era songs as Lindy Hop is still done today.